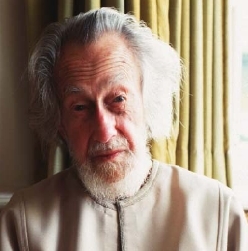 The following is the text of a talk given at the Temenos Academy on July 14, 1999 to an audience by no means altogether familiar with the writings of these two men. In the title of this talk the name Schuon is put before that of Guénon because it will be mainly about Schuon, as a sequel to the talk I gave two years ago on Guénon alone. But in principle their message is one and the same. The main theme of both is esoterism, that is, the inner aspect of religion summed up by Christ in his affirmation that "The Kingdom of Heaven is within you" and also "Seek and ye shall find; knock and it shall be opened unto you." Inevitably they wrote about exoterism also because although some rites are purely esoteric, the main obligatory rites of a religion which are exoteric as performed by the vast majority become esoteric when performed by the minority of esoterists. In other words, subjectively speaking, the aspirations of the majority stop short at salvation, whereas the aspirations of the minority stop short at nothing less than sanctification. It is true that there are many degrees of sanctification, and in consequence esoterism consists of circles within circles, for "many are called but few are chosen". But this fact does not figure largely in our present context, since Guénon and Schuon never allow their readers to forget that spiritual aspiration in the full sense will be satisfied with nothing less than the Supreme Identity, that is the actual realization that one's true self is none other than that One, Absolute, Infinite Perfection which we name God. Both writers are in agreement about essentials, but very different in their manner of expression. Guénon of course was the pioneer, and already as a young man he saw clearly that in the West human intelligence, generally speaking, had come to be left out of religion. It no longer participated in the things of the spirit, and he was acutely conscious of the need to express spiritual truths in such a way as to win back the intelligences of virtually intelligent men and women for the only object that could truly satisfy them, namely Divine Reality, the Object for which intelligence exists. To do this, in a world increasingly rife with heresy and pseudo-religion, he had to remind twentieth century man of the need for orthodoxy, which presupposes firstly a Divine Revelation and secondly a Tradition that has handed down with fidelity what Heaven has revealed. He thus restores to orthodoxy its true meaning, rectitude of opinion which compels the intelligent man not only to reject heresy but also to recognize the validity of faiths other than his own if they also are based on the same two principles, Revelation and Tradition. Guénon's function as pioneer went, no doubt providentially, with a style of writing wherein he could be likened to an archer. His teachings came forth like arrow after arrow, shot from a basis of unwavering certitude and hitting, in the vast majority of cases, the very center of the target. The undeniable attraction that lies in such spontaneity explains the immense attraction that Guénon's writings continue to have for his readers. It is true that there is a danger of simplification in such a style, and also, inevitably, one or two arrows went wide of the mark. But Schuon has shown himself to be a providential complement to Guénon. An aspect of the difference between the two writers was bought home to me in connection with one of Guénon's masterpieces,The Reign of Quantity. I had the privilege of being the first person to read this book which the author gave me chapter by chapter. When it was finished he said: "Now I will write a fair copy of it." But the fair copy proved to be almost identical with the so-called "rough copy", whereas when Schuon wrote a fair copy many changes were made in the process, nor was there any guarantee, to say the least, that the fair copy would not become itself a rough copy for a still fairer copy. Not that he had any difficulty writing, and he himself also 'shot arrows' in his own particular way. But he never simplified, and he was exceedingly conscious of the extreme complexity of the truth on certain planes, nor was he easily satisfied that he had done justice to that complexity. It is typical of him to go as far as is legitimately possible to meet, on their own ground, the holders of an opinion against which he is arguing. In other words, his theses are worked out in detail with all possible objections foreseen, given their due, and outweighed. By way of example, in The Transcendent Unity of Religions, he broaches the question of missionaries -- in particular Christian missionaries, since the book is primarily for the modern West. He does justice to the life of sacrifice led by most missionaries and admits that in some cases it has subjectively even a mystical value. He allows that there are relatively rare cases where an individual is more suited to a religion other than that of the world where he or she was born and brought up. But he reminds us also -- I quote his words: "It is possible to pass from one religious form to another without being converted." He adds that this may happen -- again to use his actual words "for reasons of esoteric and therefore spiritual expediency". He gives no example, and then passes on. But we will stop here for a moment because the first examples that spring to mind are those of the two men who are the theme of this talk. 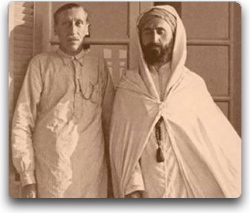 Both Guénon and Schuon were brought up as Christians and both, at a certain stage of their lives, made the change from Christianity to Islam. At first thought the "spiritual expediency" in question might seem to be, in both cases, the presence of a great spiritual Master in the religion to which the change was made and the absence of his counterpart in the other, and this is certainly the true explanation of the subsequent changes which took place along the same lines, for although Schuon had many disciples who had been brought up as Muslims, the majority were of Christian or Jewish origin. But on second thoughts, as regards Guénon and Schuon themselves, the above explanation is not convincing. It is true that Guénon received a Sufi initiation from one of the representatives of an eminent Egyptian Sufi Shaykh whom he never met, but to whom, later in life, he dedicated his book The Symbolism of the Cross; and it is also true that Schuon became the disciple of the great Algerian Sufi Shaykh Ahmed al-`Alawî whose successor he undoubtedly was. The book from which the last two quotations come, The Transcendent Unity of Religions, published in French just over two years before Guénon's death, was the only book of Schuon's that Guénon read, and he had the highest praise for it, especially for a chapter entitled 'The Universality and Particular Nature of the Christian Religion' which might be said to fill in some gaps left by Guénon himself. The title of another of Schuon's books, Esoterism as Principle and as Way, may be said to sum up his writings as a whole. But to sum up Guénon's writings it would have to be changed to 'Esoterism as Principle with a view to the Way'. Guénon never lost sight of the Way, and indeed it might be said that one ofhis chief themes was 'the way to the Way', but he did not write about the spiritual path directly whereas Schuon did, being himself a spiritual master with many souls under his care, and in consequence his writings are rich in psychological observations of the utmost importance. Jung once remarked, not without sagacity: "The soul is the object of modern psychology. Unfortunately it is also the subject." But it may be doubted whether Jung realized how fully this amounts to a condemnation of the modern science in question. In traditional civilizations it was taken for granted that the soul can only be examined from a level higher than itself, that is, from a spiritual level. The priests were the recognized authorities. And when Schuon speaks about the soul we spontaneously accept what he says in the certitude that he is speaking from a level which transcends the psychic domain. Let me say in passing that Schuon was remarkably aquiline in appearance, so much so that the Sioux Indians who adopted him into their tribe would refer to his followers as "the eagle people". After he had come to live in Indiana, he was visited every year by a Crow medicine man, Thomas Yellowtail. And Schuon once remarked to me that some people might find these regular visits surprising but that the explanation was very simple. In his own words: "Yellowtail is profoundly conscious of being a priest by his very nature and he senses the same consciousness in me, despite the many outward differences between us". For the first half of this century it is not on Guénon but on Coomaraswamy that we have to rely as regards the artistic dimension. But though this dimension is somewhat strangely, absent from Guénon's writings, we must remember with immense gratitude all that he bas written about symbols, and symbolism is the language of sacred art. Schuon once said to me: "On symbolism Guénon is unbeatable." In actual fact we always spoke French together, and when he said: "Sur le symbolisme Guénon est imbattable," he banged his fist on the table three times, once for each syllable of "imbattable". What is that all? The answer to this question is the theme of a chapter in Esoterism entitled 'The Triple Nature of Man' and much of his other writings are concerned with this threefold totality. To sum up, it is a question of knowing, willing, and loving the Divine Reality; and since the Way demands perpetual consciousness of this triad, for easy remembrance Schuon often words it Comprehension, Concentration, Conformation. The faculties in question are intelligence, will and soul or character and they correspond respectively to the Truth, the Way and Virtue, that is to doctrine, method and morals. It might be objected that both the intelligence and the will are faculties of the soul. But in man as he was created and as he seeks to become they infinitely transcend the human plane: only at its lowest extremity does the intelligence enter into the psychic substance, and only the most superficial extremity of the will is human in the limited sense of the word. The intelligence is a ray of light proceeding from the Divine Truth, and the will is rooted in the Divine Self. One of the first problems of the Way is that for profane man intelligence and the will have been reduced to becoming the soul's means of satisfying its desires. They are the servants and it is the master. The Way begins on the understanding that henceforth the so-called master must follow the directives of its one time servants. That is not easy, and to begin with the psychic elements are divided amongst themselves, the majority submitting readily enough to the change -- otherwise there could be no question of the Way -- but the remainder in varying degrees of being unreconciled or undecided. Guénon avoids the moral issue, possibly because he was conscious of a widespread reaction, in his own generation, against unintelligent moralism. But Schuon dwells on this dimension in his own unmoralistic way, with considerable stress on the importance of outward beauty, whether it be of nature or of art, as a prolongation of the inward beauty of virtue. Of his disciples he demanded beauty of soul as an altogether obligatory basis without which the intelligence and the will cannot operate as they should. He continually quoted in writing and in speech, the Platonic dictum "Beauty is the splendor of the True", in the sense that inversely, if that splendor is lacking, it means that the Truth is not fully present. Another example is in the following passage, which also serves to express an aspect of what Schuon aims at doing through his books. It serves the same purpose as regards Guénon also, who would have totally agreed with it; and it illustrates a difference, for it very clearly comes from Schuon's pen and not from his. It might seem unexpected that Schuon, who, unlike Guénon had an esoteric function, should have written much more than Guénon did about each religion as a whole, its outer as well as its inner aspect. But he did this partly for the enlightenment of his disciples, for a way of knowledge in the full sense calls for a certain understanding of the Divine economy of things. I say partly because he did it also for his own satisfaction. He once said to me: "If there was a religion which I did not love, I would not rest until I loved it." For him the religions were among the great signs of God, each one to be marveled at, and he demanded this attitude from his disciples insofar as they were capable of it. What is not generally known however is that he wrote some texts exclusively for them and not for publication, though certain passages have been incorporated into some of his later books. These texts, about 1200 in number, most of them consisting of only one page, may be said to belong to the innermost center of Sufism, and by extension to all other innermost spiritual centers; and since every true center has its radiations, we will give here two examples. The first, of which we will only give the central part, is entitled 'The Chain of Quintessences'. The quintessence of the world is man. The quintessence of man is religion. The quintessence of religion is prayer. The quintessence of prayer is invocation. Here lies the meaning of the Quranic verse: The invocation of God is greater [than anything else]. If man had no more than a few instants to live, he would no longer be able to do anything but invoke God. He would thereby fulfill all the demands of prayer, of religion, of the human state. The second of these texts is entitled 'The Two Great Moments', and with it I will close my talk. 1. Sophia, Vol. I, No. 1, Summer 1995, pp. 21-37. 2. Studies in Comparative Religion. Vol. 17, no. 1. 3. The Transcendent Unity of Religions, Wheaton (Illinois): Theosophical Publishing House, 1984, pp. 30-31. 5. Spiritual Perspectives and Human Facts, London: Perennial Books, 1970, p. 138. 6. Esoterism as Principle and as Way, p. 125. 7. In the Face of the Absolute, Bloomington (Indiana): World Wisdom Books, 1989, pp. 89-90. 8. Understandinglslam, Bloomington (Indiana): World Wisdom Books, 1994, p. 137. 9. Echoes of Perennial Wisdom, p. 39.